Yay. Only one more episode to go. I must days that while I was sad when Full House Take 2 ended a few weeks ago, that will not be the case with this drama. It had so much potential only to fall in the muck and mire with a badly written plot from episode 9 onwards, horribly written and inconsistent characters, and some rather weak acting to boot. That being said, I will really miss Lee Hoon, Jae Hee, and Kim Jae Won. Oh, and the actress who played Bong Hee. That’s all. How sad. I think this is the first drama I have stuck all the way through when I absolutely started hating the plot and characters. Yay me…I guess. Geum Hee hands over the microfilm to Hae Joo explaining that this is Hak Soo’s legacy—the item that caused all the suffering. Jang shakily takes out his phone and pushes record as Hae Joo looks at the film canister and says she recalls Jung Woo saying something about this film causing San’s parents’ death. Kim Jong Bo even testified about it. Just what is it? Geum Hee doesn’t know, but she does know that this was the entire reason Jang Do Hyun killed Yoon Hak Soo. Hae Joo then asks her mother where she got it from. Geum Hee says it was from the safe in Jang’s study. This freaks Hae Joo out. Her mother needs to leave that house before her duplicity is discovered—too late for that. Geum Hee promises to leave soon after she has a talk with In Hwa. Hae Joo is her daughter, but so is In Hwa. Hae Joo tells her that she understands and to be careful. Geum Hee grabs her daughter’s hands and warns her to be careful as well and to get the film to Jung Woo as quickly as possible. Jung Woo is in his office planning out the appeals trial for Jang. Yi Soo says preparations are going well, but since there was no solid evidence the results will likely be the same. Jung Woo says nothing is certain, so they should have hope. Enter Hae Joo. What is she doing there? Hae Joo reveals that Geum Hee found the microfilm. She then passes it over to Jung Woo who gives it to Yi Soo to quickly decipher. Will they really get to the bottom of the secret before Jang does something? Geum Hee arrives home and is immediately grilled by her husband. Where did she go? She met someone. Who did she meet? Hae Joo. Why does she have to even bother telling him that? Jang then gets up and pulls out his phone and plays back the conversation he recorded. This shocks Geum Hee, but she actually hides it pretty well. Jang demands to know if she came back just for that. She says nothing. Jang then says that no matter what Geum Hee comes first since and she is even first before his son. Jang then says he’s done everything just for her. Geum Hee then yells at him and calls him a shameless monster. So he met with Il Moon’s mother, killed her husband, and got rid of Yoo Jin because he loved her? Jang then angrily demands to know why she can’t understand that he did everything just for her. Geum Hee says that all her feelings for him has turned into the desire to kill him. However, she doesn’t want to stoop to his level. She rushes upstairs. Jang follows her and tries to get her to stop packing. It doesn’t matter if she loves him or wants to kill him—can’t she just stay by his side? Wow. This guy is…stupid? Obsessed? How could you want to live that life and what makes you think she’ll comply? Geum Hee tells him to get his hands off her since his touch disgusts her. This earns her a hard slap across the cheek that sends her flying onto the bed. Jang looks completely shocked by this. He stutters out an apology and Geum Hee gets up and smiles saying that is his true face. She picks up her suitcase and Jang then confesses he gave the order to have Hae Joo harmed in order to get her. He went crazy from the day she married Hak Soo. He pleads with her to stay since she is his everything. Geum Hee tears up and says he’s a liar, a killer, and his ambitions are not good. He will get his just desserts in the end—just you wait! Geum Hee then walks out the door while Jang…throws himself on their bed to cry? Are you serious? This scene just seems too ridiculous for me to believe. San takes Hae Joo to a deserted restaurant that is dimly lit and full of candles (plus its all decorated for Christmas). She is shocked. san sits her down and basically announces this is for his official proposal. He’s rushing it a bit since her current behavior has been worrying him. He takes out a ring and says he has many faults and is actually not as worldly. Plus, he has no family. When he was in America, he only thought of resurrecting Haepoong, and didn’t have a chance to make friends. He needs someone who will stay by his side forever. Hae Joo bows her head and cries as he asks her to be his wife and family. Hae Joo can only shake her head and say they cannot be together. Wae? Is it because of Chang Hee? Is she still not over him? Hae Joo says that isn’t the case. Then why. What is San lacking that she won’t marry him? Hae Joo says they can only be good partners and that is all. I hate that she never explains herself or her reasons. San demands to know the reason. He deserves that. All Hae Joo can say is they cannot be and she runs off leaving our poor heartbroken San behind. Idiot. She’s an idiot. Hae Joo walks and all she can do is look back and cry. Babo. Honestly, San would not care who her real father is, so why must she do this? Poor San just sits in the restaurant and peels petals off the roses as he fights back his tears. But we all know that he won’t give up—right? Chang Hee gets to the Jang house where he finds Jang sitting in the dark. He says he’s meeting with Ocean the next day and needs the microfilm. Jang only says they will talk about this later. He tells Chang Hee to leave and turn off the lights. Chang Hee does, but you can tell he’s really trying to figure out just what is going on. At the same time, Geum Hee meets with In Hwa to tell her what is going on. Geum Hee confesses she can no longer live with Jang. In Hwa can’t believe this. Why? Geum Hee then reveals that all the stuff from the press conference was true. How can that be? Didn’t Geum Hee assure In Hwa it was all lies and that she believed in Jang? Geum Hee again asserts it is true. Jang killed her husband and ordered Hae Joo to be killed in order to have Geum Hee as his wife. Geum Hee takes In Hwa’s hands and says that she loves her and will always run to her daughter whenever she is needed. In Hwa looks totally floored. In Hwa rushes home and demands to know how her father could do such things as ordering a baby’s death. Jang gets up and tries to hug his daughter. In Hwa backs off and says that with Geum Hee gone she has no reason to come to the house any more. Their relationship is hereby ended. Jang cannot believe this. In Hwa is unhappy to bear his name or blood and wants nothing more to do with him for his evil deeds. She leaves and goes home to confront Chang Hee. He knew all along since he’s the closest to her father. How could he hide it so well and work for Jang? Chang Hee then asks what else was he supposed to do since Jang was her father. In Hwa tells him to stop lying since he’s just like her father. For his own ambition he used everything—even her. In Hwa then rushes out as Gi Cheol opens the door. He asks Chang Hee why she is like that. Chang Hee can only fight back his tears. San reveals to the Chun family that Hae Joo rejected his proposal. This floors them all. How could that wench do that to him? Their project was successful and now they just need to sit back and make their money. San reveals that he thought it might have been because of Chang Hee, but now he thinks there is some other reason for Hae Joo to push him away—he just doesn’t know what that reason is. Dal Soon then tells San to get her drunk and Sang Tae interrupts. Hae Joo has such a high tolerance for alcohol so San would end up dying. San then asks for the family’s help. Sang Tae and the rest quickly promise their aid in his winning over Hae Joo. They then all go out to eat together. In Hwa goes to find Hae Joo. Just what does In Hwa want? In Hwa confesses she heard everything from Geum Hee. Hae Joo only says there was no reason for Geum Hee to tell In Hwa everything. In Hwa then says if it hadn’t been for her father, Hae Joo would be living with her real parents and wouldn’t have lost Chang Hee. Hae Joo assures In Hwa she bears her no ill will since it wasn’t her fault. In Hwa tears up as she has taken everything from Hae Joo. Hae Joo says that isn’t the case. If anything else, In Hwa saved Geum Hee’s life allowing Hae Joo to meet her mother again. Plus, Hae Joo is completely over Chang Hee, so she only wants the two to be happy. In Hwa and Hae Joo then share a sisterly hug (after Hae Joo says they are practically like sister. Nope—they ARE real sisters). Chang Hee is drinking in the kitchen when his father joins him. Gi Cheol does not look happy at all. Chang Hee smiles and asks if he’s doing well. He’s doing the right thing, isn’t he? Gi Cheol says that Jang has caused them to suffer so much. True. But why does Chang Hee’s heart hurt so much now? Is Chang Hee like this because of In Hwa? Chang Hee says that the girl did nothing wrong. Is it right for him to completely destroy her life just because she is Jang’s daughter? Gi Cheol tells him he must harden his heart and go forward with the revenge plan. As soon as Hae Joo gets home, her family sits her down and basically asks if she’s out of her mind to turn down a man with a good education, background, and undying love. LOL. Hae Joo doesn’t want to hear this and tries to go to her room, but her family won’t let it go and keeps running down the list of all the reasons Hae Joo is crazy to give San up. Hae Joo then gets angry and says she already knows. Dal Soon then asks what the problem is. Hae Joo says its precisely because San is such a good person and a catch. She yells at them to stop and rushes to her room. Jung Woo comes in and asks what happened. Dal Soon tells him about the failed proposal and Jung Woo immediately asks to know where San is. Jung Woo then calls San to his office. The younger man wonders why they couldn’t just talk at home. Jung Woo doesn’t answer to that and just cuts to the chase. He heard Hae Joo rejected San’s proposal. Jung Woo then tells him that Hae Joo had her reason. San is now at the same turning point and is hoping that San will do better than him. San doesn’t get it. What is Jung Woo talking about? Jung Woo just hopes that San can be understanding towards Hae Joo. San assures him that he can be. Jung Woo says it is difficult to understand. Just what is going on? Jung Woo takes a deep breath and then reveals that Hae Joo is Jang’s biological daughter. Needless to say, San is shocked. He goes out to the overlook where he watched his grandfather weep helplessly 13 years ago. He recalls that memory, and the story of his parents death thanks to Jang Do Hyun, and his grandfather’s death. He goes back to Yoon’s house and looks in the direction of Hae Joo’s room. He recalls their past as children and their relationship as adults. What will his ultimate decision be? I honestly can’t think he’ll let her go. San reaches out to knock, but can’t bring himself to do it. Meanwhile, Hae Joo fights back tears on the other side of the door as she reaches out. But like San, she can’t bring herself to do anything. She squats and cries looking at the door while San just stands still like a statute. Jung Woo calls Hae Joo into his office and tells her to stop pushing San away since they both like each other. Hae Joo says she has to since she feels so badly towards him. Jung Woo asks if she is doing this because she is really Jang’s daughter. Hae Joo angrily tells him to not say that. Jang is NOT her father. Then there isn’t a problem is there? Hae Joo says she isn’t confident of San’s reaction and doesn’t have the strength to tell him since he’s lost everything because of Jang. Jung Woo reminds Hae Joo of San’s bright nature and positive outlook. He is certain that San will handle the news better than Jung Woo originally did. Enter Yi Soo who has the information from the microfilm. He gives it to Jung Woo who is surprised to see that it’s only a ship’s blueprint. Hae joo looks at it and is shocked. It’s a blueprint of a ship that could have easily been built in Korea at the time of Hak Soo’s death. Is she certain of this? Very. Just what is going on then? I have no idea. Jang opens a safety deposit box. Inside is the REAL microfilm. D’oh. Looks like he really didn’t trust any one. He takes it to Chang Hee and shows it off. Jang refuses to decipher it as that will give away their edge. Chang Hee says that Ocean will not trust them if they do not have the film deciphered. He then changes tact. How about they outright by the drilling rights so they don’t have to share profit with another company. Jang says while that is true, there is not enough money in the company. Chang Hee says that with the slush fund money, selling Jang’s stocks, and something a bout a loan, they will have enough for the drilling rights. Of course, Jang is not enthusiastic for this deal since that means he’ll lose all power over Cheonji (just what Chang Hee wants). Chang Hee assures him that once they extract the oil everything will be righted. If Jang has any other way, then let him know. Jang tells Chang Hee to begin negotiations and he’ll figure out the slush fund or loan problem. Chang Hee meets with Ocean’s president who is shocked to hear Chang Hee wants to buy the oil drilling rights. Chang Hee sighs and says it is a big headache for him to do such a thing, but it’s what the former president of Cheonji (aka Jang) wants. Ocean replies there is a problem because San owns half the oil drilling rights thanks to their technological collaboration. If San doesn’t agree, it won’t be easy for Ocean to give the drilling rights to Cheonji. Chang Hee says he will take care of that and then asks how much Ocean wants for the rights. The president then goes to San’s and tells him. San, Hae Joo, and Bong Hee are furious. Ocean backing out of the contract and partnership puts them in a very bad position. Ocean’s president whines that the coast of actually producing the drill ship is too much for Ocean and that hey are better off giving away the drill rights since there is no guarantee that oil will be found. Hae Joo asserts that they will find the oil, plus they have the famous oil sociologist Lee Bong Hee on their side. Ocean says that without concrete proof of oil, they can’t take the risk. San then reminds him that thanks to the contract, they get half the drilling rights so Ocean cannot just transfer the rights themselves. Ocean then says they are letting their half go and the rest will have to be negotiated with Cheonji. This floors and angers our trio. So Cheonji has stabbed then in the back yet again. San then demands to know who they talked to at Cheonji. San storms into Chang Hee’s office and greets him with a right hook. It’s about time someone knocked Chang Hee on his rear. Do you think this will knock some sense into him, too? Chang Hee gets up only to be punched again. San demands to know how far he will go. Chang Hee was his only friend from childhood. How could he do this? San then says that no matter what happens, he will never give up the drilling rights, so bring on the law and whatever he has. Chang Hee only smiles and says he thought San was smart. Can’t he think? San angrily demands to know what Chang Hee is talking about. Chang Hee won’t say and only tells him to be good to Hae Joo. He then turns his back where his smile falters. Shakes head. Just think what would have happened if Chang Hee joined Hae Joo and San. Wouldn’t Jang already be punished for his crimes? But now, Chang Hee had to take the long, dark, and dirty road. Jung Woo meet with Bong Hee and reveals the film she stole was a fake. Geum Hee asks why he would place a fake safe. Jung Woo says it was insurance against the NIA investigation. Geum Hee says she must go back and Jung Woo firmly tells her that is not a good idea since Jang already knows she betrayed him once. Geum Hee still insists since everything happened because of that microfilm. Jung Woo stops her before she goes and tells her not to take what he said to heart. Hae Joo is his niece and Hak Soo has already forgiven her. Jung Woo says he cannot forgive everything, but he’s trying to for Hae Joo. Geum Hee thanks him for that. Jang meets Il Moon in jail. Jang is angry to find that his son is getting abused in jail, but what can he do? Jang asks if he’s cold. Il Moon says of course he’s cold, and now he’s even gotten sick. Jang apologizes. Il Moon is not happy for this. How can that one simple apology fix everything? It’s about time Il Moon also abandoned his father like everyone else. Jang tears up a bit and says he will send Il Moon a sweater. Il Moon also tears up and tells his father that since he’s already abandoned him once, he had better keep abandoning him until the end. Jang chokes up as Il Moon asks to leave. Jang goes back home to find Geum Hee destroying his office in search of the film. She angrily demands him to give her the film already. Jang won’t do that. He talks of his love and Geum Hee throws all his sins back in his face. If he really loved her, how could he tear her heart out for 27 years? Jang again insists that he does love her and tries to kiss her. Geum Hee fights him off and again says that his touch disgusts her. She screams for the film again and then starts hitting him. She calls him incurable and says that it will be really unfair if he escapes punishment. She then rushes out. In Hwa is cleaning and says it’s for a fresh start. Jang comes in and In Hwa angrily throws the rag down and slams into a different room. Jang asks where Chang Hee is. Gi Cheol says he’s still at the office. Jang says nothing more and walks out. He’s definitely not happy to hear that Ocean wants 500 billion for the drilling rights. That’s just ridiculous. Chang Hee reveals that he talked them down from 1 trillion to 500 billion. Jang says that sum is possible with the slush fund, but Chang Hee says that isn’t enough. They need 500 billion for ocean alone, plus more for Hae Joo and San, and the actual drill ship development. So how much is Chang Hee really asking for? 1.5 trillion. Omo. INSANE! Jang clenches his teeth. So he’ll have to give up everything? San is holding a meeting and Hae Joo wishes to know how they can be defeated by Cheonji since they hold half the drilling rights. San then mentions he thinks Chang Hee is hiding something. It looks like Chang Hee is trying to throw a coup for his own revenge. Bong Hee doesn’t buy this, but Hae Joo quickly jumps in. She thinks it is very possible. San looks at her and she tells him the story of what happened the last time Chang Hee met with her. Chang Hee mentioned something about San and Hae Joo doing nothing as it’s up to him to take revenge. Yang Do Ri reports on the slush fund to Chang Hee. A thorough investigation is being carried out. Chang Hee hands over the company funds report and asks Yang to thoroughly investigate how Jang spent the money as well. Once he’s done, send the report to Yoon Jung Woo. This shocks Yang. Well…Chang Hee’s revenge really makes no sense. He plans on utilizing Jung Woo, but at one point he had him thrown under several buses and nearly fired multiple times. What would he do if Jung Woo was no longer a prosecutor? Bong Hee barges into Jung Woo’s room as he’s changing. He yells at her to shut the door as she peeks through her fingers at his shirtless state. Bong Hee closes the door and tells him its okay now. Jung Woo is startled. Didn’t he tell her to close the door and leave? No, didn’t he tell her to just close the door and stay? When did he say that? He demands she leave so that he can finish changing. Bong Hee covers her eyes and assures him she won’t peek. He yells at her to get out. Bong Hee drops her cutesy act and says that there’s nothing to see any ways and walks out. She leans against the door talking about how lucky she was. This shocks the Chuns. What is she talking about? Bong Hee says nothing and just starts eating. She cracks up and Dal Soon cracks a big smile as well. Jung Woo exits and goes to sit on the opposite side of the table. Dal Soon quickly has Jin Joo move so that he can sit next to Bong Hee. LOL. Dal Soon calls them the perfect couple and Young Joo and Dal Soon tries to get Jung Woo to feed Bong Hee. Dal Soon then says they should just make a baby. Bong Hee says she’s always ready and Jung Woo uncomfortably asks where San and Hae Joo are. LOL. Cute. San is waiting for Hae Joo at the docks. San reveals he knows why she’s pushing him away. He heard it from Jung Woo. She turns to him in shock. San then asks if she believes she’s Jang’s daughter. Hae Joo quickly asserts that she isn’t. San gently asks what the problem is then. Hae Joo says that everything bad that happened to San is a result of Jang Do Hyun’s evilness. So what? Hae Joo is not like her biological father at all. Didn’t Hak Soo and Hong Chul raise her as their own? Didn’t Jang also take them away from Hae Joo? Plus, Jang tried to kill Hae Joo in order to have Geum Hee. So how are San and Hae Joo any different? Hae Joo says she still has his blood in her veins. San reminds her that she doesn’t claim Jang as her father, so why is she pushing him away? Hae Joo says this is because she feels sorry to San. San assures her that it doesn’t matter if she has Jang’s blood or not. Doesn’t Hae Joo know he can’t live without her? When she pushed him away, how much did she hurt herself? Hae Joo, always the self sacrificing idiot, again insists about leaving. Why does she have to have Jang’s blood? San pulls her into a hug and tells her he understands. She’s not allowed to push him away and say she’s leaving him again. Okay? Because San can’t take it. Hae Joo cries and snuggles into his shoulder, apologizing. The two go back to Jung Woo’s house where San scolds her for hurting his heart. Hae Joo apologizes once more for hurting him. San stops and rubs his chest. The only thing to cure the pain can also grow naturally in the body. What does he mean? Endorphins can perfectly help and have the same effect as morphine. Hae Joo smiles. So? Ah, so to forget this pain that she’s tormented him with for 28 days, she will need to kiss him 28 times. Is that so? Hae Joo gives him a small peck on the lips and runs off laughing. That will be enough, right? San chases after her. He said a kiss not a smooch. Meanwhile, Chang Hee goes home and sees In Hwa lying in their bed. He brushes her hair lightly off her forehead. I think he likes her a wee bit. Is it love or just pity for his sins? Really hard to tell with him. The next day Jung Woo is excited to reveal the financial information that Chang Hee had Yang gather. With this evidence, no judge in their right mind will let Jang off the hook. Jung Woo has Yi Soo double check everything while Jung Woo puzzles over who could have sent the information. Meanwhile, Jang is meeting wit Jo and his lawyer. Jang is furious to know that whoever president Go is betrayed him. Jo reveals that it wasn’t just Go. She has seen Yang Do Ri meet with him several times and they all know that Yang is Chang Hee’s right hand man. This floors Jang. Chang Hee? Jang shakes and starts cussing him out. You deserved that. Gi Cheol stares out over the water as Jang rushes home in a fit of rage. Gi Cheol rushes up to him only to get beaten. Where is his son? Gi Cheol asks why he’s acting like that. Jang doesn’t answer and just keeps beating Gi Cheol and asking where Park Chang Hee is. Gi Cheol says nothing and is carried away by Jang’s men. In Hwa witnesses all of this. Jang angrily tries calling Chang Hee. He puts on a calm front and asks to meet Chang Hee at a special place other than the company. Uh oh. What is going to happen? Chang Hee goes to the overlook where he and Hae Joo had their discussion about their future. Hae Joo revealed she only wanted a small ship while Chang Hee greedily wanted all of Cheonji. He smiles at the memory. His smile fades as Jang arrives. He asks why Jang wanted to meet. Jang says that he used to go there to think about how he could take over Haepoong. Chang Hee has come their often to plot Jang’s demise, too. Chang Hee smiles. Jang demands to know why Chang Hee betrayed him and Chang Hee says he discovered earlier than he thought. He then reveals that he’s doing all this because of what Jang did to the Park family. Chang Hee reveals his ultimate plan to destroy Jang and says it’s too late for Jang to do anything. Jang shakes in rage and Chang Hee demnads Jang to kneel and beg. Jang just laughs. Who will kneel down in the end? Let’s see. Gi Cheol is then brought in with two carloads of Jang’s men. This shocks Chang Hee. Gi Cheol yells at his son to leave and is hit. Chang Hee then rushes towards his father only to be clubbed in the back by Jang. Father in son lie on the ground in front of Jang. When he goes to slam his club into Chang Hee, Gi Cheol quickly covers his son. Gi Cheol collapses and before Jang can hit Chang Hee, In Hwa arrives. She rushes over to Chang Hee. Jang orders her to be dragged away, but In Hwa reveals it will do no good as she has already called the police. Sirens are then heard in the distance. Jang looks over in shock. HIs men grab him and run for it while he shakes and angrily looks at his daughter before running away. Meanwhile, Chang Hee shakes Gi Cheol who doesn’t respond. Jang’s hand shakes uncontrollably while his driver asks where they should go. Jang says he needs to see his wife. He then bites his hand and demands to know why it is shaking. He arrive sat Geum Hee’s room only to find Hae Joo. He pushes her out of the way and yells for his wife. He needs her. Hae Joo screams at him to disappear since Geum Hee hates to see his face. Jang turns on her and says this is all her fault. This surprises Hae Joo. Jang starts strangling her and says everything will go back into place once she is dead. Enter Geum Hee. She yells at him to calmly stop. Geum Hee screams—doesn’t he know who Hae Joo is? Hae Joo shakes her head, but Geum Hee screams that Hae Joo is his daughter. Jang is in shock. And that’s where this episode ends. Not much left to tie up in the final episode. This all seems very melodramatic and over the top. I mean…it’s just more or less absurd to me all that is going on here. Or rather…just horribly predictable. I applaud your perseverance in recapping this terrible drama. Like you, I also found several scenes that were ridiculous. Can you really imagine a devious person like Jang throwing himself on the bed instead of chasing after his wife and dragging her back when she was leaving? Also, Hae Joo is supposed to be a fighter so how can she just let Jang strangle her without trying to knee him in the “you know where”? Han Ji Hye was terribly miscast in this role; I’ve never disliked a leading actress as much as her and will probably pass on any future dramas she’s in. I know, there are too many moments where you scratch your head and go WHY on earth did that character do that? Jang as a whiny petulant child throwing himself on a bed when his wife leaves him? I can only imagine the tough Lee Duk Hwa cringing at that. And, yes, Hae Joo fights any other time, but not when Jang tries to kill her? Why she seemed so shocked when half crazed man turned on her is beyond me. Sigh. Only one more episode left! WHY did I finish this drama? I absolutely agree! This drama has gone from mildly interesting to ridiculous and overly melodramatic. I’m sure we really needed Hae Joo to be Jang’s daughter?! -.-” And in any case, Han Ji Hye’s acting was incredibly stilted this time. I was actually positive about her acting until I got past the first 10 eps of her appearance and just could not stand how she only has one look, which is the look upwards with widening eyes in a blank / perpetually surprised look. Sure her tears well up nice and good, but there’s no emotional build-up not come-down cause she just gets on with life. She also seems to have little chemistry with Kang San. Sorry to the fans out there but seriously, Kim Jae Won deserves so much better. You can actually see how he puts in effort to make it seem he really loves her, but Hae Joo’s poor responses simply do not get me rooting for her. 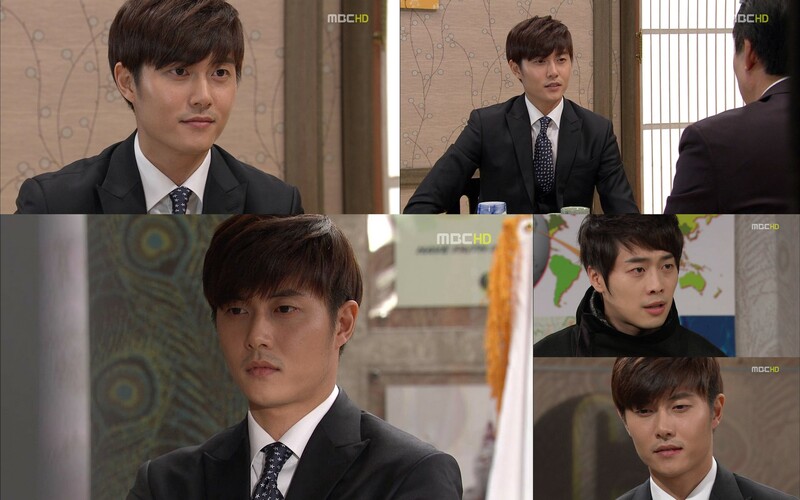 I’m a serious fan of Jae Hee and I really liked how he carries the dark brooding side. But that’s just me being biased >< In any case, I wonder how this drama spiralled out of control so much that Chang Hee's character became that one-sided. Glad that his relationship with In Hwa is turning for the better since I really appreciate how she carries a torch for him knowing all his faults. Kinda pessimistic about the ending but will hang in in there since I've been here for the past 37 eps. thank god the end is so near!!! n NeeNee thanks a lot for the recaps. U really deserve a standing ovation for recapping this one. I sincerely mean it. Recapping 38 episodes of this one requires courage, immense patience, n i dont know what else!! !